Airgyro's motto is "Let there be flight." I like that and it shows the creativeness of entrepreneurs making up the LSA industry. Featured above is Airgyro's newest SLSA, the $120,000 Outback 2. At lower right is the $65,000 fly-away Sport Hornet, now marketed by the Utah company. Airgyro Aviation sounds like a rotary wing outfit. Indeed the Spanish Fork, Utah company represents and trains in the fully enclosed Sportcopter 2. In fact, Airgyro is the only place you can get "both fixed wing and auto gyro training," said president Nate Oldham. The company recent added another "2," the Outback 2 built by Australian Lightwing. One day after Oshkosh '08, Nate called to report Airgyro obtained SLSA approval #85. *** Based on a two seat version of the Experimental Outback 4, the conventional looking low wing is manufactured with a steel cage structure smoothly covered with composite shells. Gull-wing doors give entry to a 46.5-inch-wide cabin. Powered by the 100-hp Rotax 912S, Outback 2 cruises at 105 knots and carries 30 gallons of fuel. Click for more features or specs. *** In addition to Sportcopter and Outback, Airgyro was appointed the exclusive sales outlet for Higher Class Aviation's Sport Hornet. The agreement will let Higher Class boss Robert Gaither concentrate on his new headquarters at the Blackwell-Tonkawa airport (K403) in Oklahoma midway between Oklahoma City and Wichita, Kansas. A move in planning for about a year, Higher Class will depart Southern California for its more centrally located home. Airgyro Aviation sounds like a rotary wing outfit. Indeed the Spanish Fork, Utah company represents and trains in the fully enclosed Sportcopter 2. In fact, Airgyro is the only place you can get “both fixed wing and auto gyro training,” said president Nate Oldham. The company recent added another “2,” the Outback 2 built by Australian Lightwing. One day after Oshkosh ’08, Nate called to report Airgyro obtained SLSA approval #85. *** Based on a two seat version of the Experimental Outback 4, the conventional looking low wing is manufactured with a steel cage structure smoothly covered with composite shells. Gull-wing doors give entry to a 46.5-inch-wide cabin. Powered by the 100-hp Rotax 912S, Outback 2 cruises at 105 knots and carries 30 gallons of fuel. Click for more features or specs. 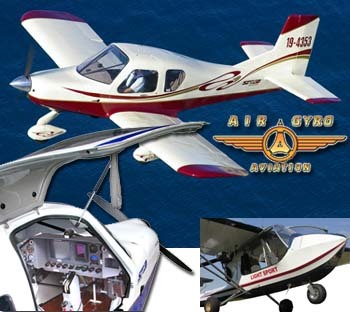 *** In addition to Sportcopter and Outback, Airgyro was appointed the exclusive sales outlet for Higher Class Aviation‘s Sport Hornet.